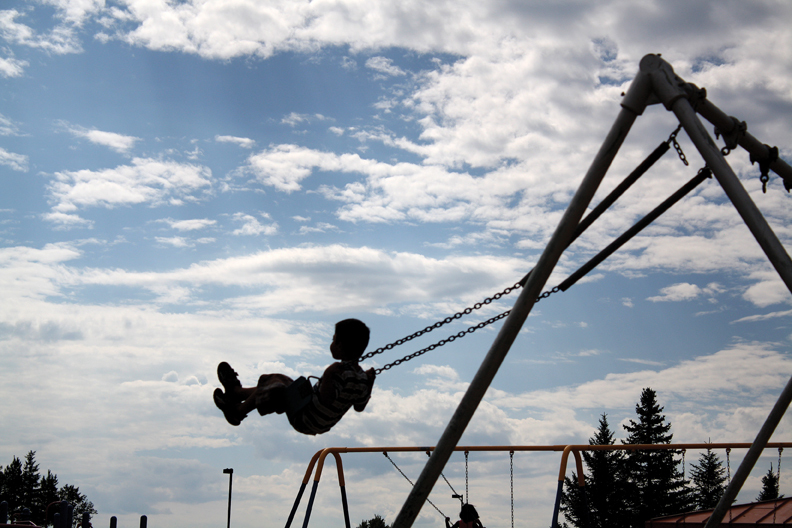 An East Elementary School student swings in front of bright clouds Monday on the first day of school during recess. Students around Moffat County headed back to school Monday for the first day of classes. Taylor Powell, a 1st grader at East Elementary School, said she was excited and was having a great first day of school. Students were energetic on the playground, doing cartwheels in the grass and pushing one another on the swing set. At Sandrock Elementary School, kindergarten teachers Karla Haddock and Cindy Prather welcomed a group of parents into the classroom for the Kindergarten Connection Day. The program is designed to aid young students and their parents in transitioning into a full-time public school environment. Parents and students participated in separate orientation sessions before working together to decorate nametags and classroom decorations. The kindergarteners were read the book “The Kissing Hand”, which tells a story of a young raccoon who is nervous about his first day of school and given a kiss to keep in his hand from his mother. The parents and their students then decorated paper hands together to hang in the classroom as a reminder to the children that their parents were thinking about them while they were away at school.